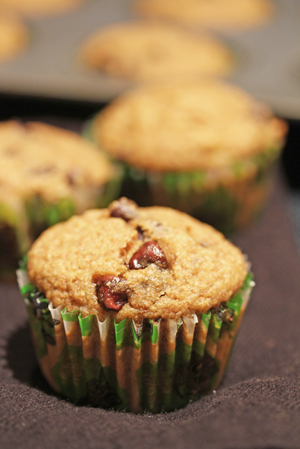 The first pantry challenge recipe for this month…banana muffins. And of course, chocolate chips! Preheat oven to 350. Lightly spray 12 regular muffin tins or spray 12 muffin tin paper cups. In a mixing bowl, whisk together the whole wheat flour, baking powder, baking soda, and salt. Stir in the honey, egg, milk and oil. Then stir in the mashed bananas. Gently fold in the chocolate chips. Pour the batter into 12 muffin cups and bake in the preheated oven for 18 to 20 minutes. Let cool slightly on a cooling rack before devouring. Chocolate and bananas, moist and delicious, I made these this afternoon. I ate some with hot coffee. Life just doesn’t get much better. These were really good! It’s the first time in a long time my boys have actually eaten their whole muffins and 2 of them had 2! Thanks! Trying to not go grocery shopping……….I don’t have whole wheat flour, just AP, self rising, and cake. Can I use any of those instead?? Yummy! I subbed out the oil for apple sauce and it was still moist and tasty! I ended up with a dozen regular and a dozen mini-muffins. Thanks for another healthy and easy snack! Great idea to sub the applesauce for oil! I do that a lot too! Glad they turned out! Do these freeze well? and if so do you just put in fridge to thaw? This is gonna sound odd, but I just used our last banana for smoothies. Do you think I could get away with just chocolate chip muffins using this recipe? Love the fact that it using wwf and honey! Not sure…you’d have to add some other “thickener”…otherwise you’ll end up with really dense whole wheat “scones” probably. Might be worth waiting until you get more bananas. And yes, I love that it’s so low in sugar…feels good feeding my kids low sugar snacks that they will actually eat, devour rather! These are awesome! I used apple sauce for oil, vanilla almond milk, used bittersweet chocolate chips but only had a 1/4 cup so I swirled in caramel sauce into them and oh my goodness! Yum! Holy cow….YUM! I just pulled them out of the oven 5 minutes ago and devoured one. These muffins are delicious! I did use unsweetened vanilla almond milk in place of regular milk, added a few drops of vanilla extract and a couple of dashes of cinnamon. SO good.